Echo, Texas, absorbed by Temple. Echo once had it's own post office, depot and identity. It was on the MKT line two miles south of Temple. The town had been known as Miller before 1884. 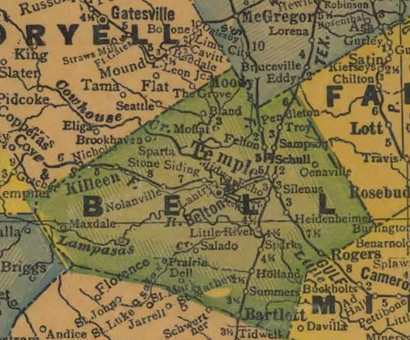 The railroad built a line called the Belton Railroad off the MKT that year and the town grew up where the two lines intersected. In 1884 a post office called Echo was granted but was discontinued 10 years later. In 1890 Echo had a depot, a railroad agent, and seven citizens. In 1948 Echo consisted of a few buildings and it was about this time it lost its identity as a separate town. Today it is totally within Temple's city limits.